Let me ask you a question: are you defining yourself by your numbers? How do you react when you see your numbers? Do you immediately launch into your go-to spiel about not having enough, not being enough, feeling like a fake? Do you bash your body and berate yourself in your mind? Do you slip into a funk, unable to think of ways to get yourself out of the hole you have dug? I totally get it. For me, it was my relationship with my money numbers. Step One: I had to figure out how much debt I was in. You cannot defeat what you refuse to face. As much as I didn’t want to, I sat down with every single statement and put together a list of what/who I owed. It wasn’t fun, but I got through it. Step Two: I chose to thank my debt. Instead of feeling down about it, I chose to thank my debt -- it had kept my belly fed, my body clothed, my car filled with gas, etc. Step Three: I decided that I wasn’t going to let my mistakes define me. I knew that what mattered was getting back up and I resolved to take it one small step at a time. Step Four: I took small actions every single day, especially when I didn’t want to. I called each credit card company and let them know what was going on. As hard as it was, I had to call my mom and ask for money (the one and only time in my life that I’ve ever asked for any amount over $100). I’ll never forget how hard it was for me to even utter the words. I took my job search seriously -- I set a daily goal for submitted applications and I hit up my network. Step Five: I surrendered to God. There’s nothing like challenges to make you remember how much you need God. I prayed, meditated, read, and reconnected. I realize now that this time in my life resparked my relationship with God and set me on a different path, one that led me up to this very moment. I did a lot of reading about financial prosperity. I especially loved the book, Money: A Love Story. In the book, Kate Northrup suggests paying off debt in the order of emotional guilt as opposed to the amount of interest you’re racking up. I found that to be very helpful and freeing. Although it was a hard time in my life, I now understand why I had to go thru it. I had to learn that my self-worth was not based on my numbers. I had to learn how to manage my money better. I had to learn how to ask for help and accept it. I had to examine my beliefs about money and start the healing process. I had to get in alignment with God and I had to have faith that God was with me and that I was capable of getting out of this ugly hole. In essence, I had to change the relationship I had with my numbers. 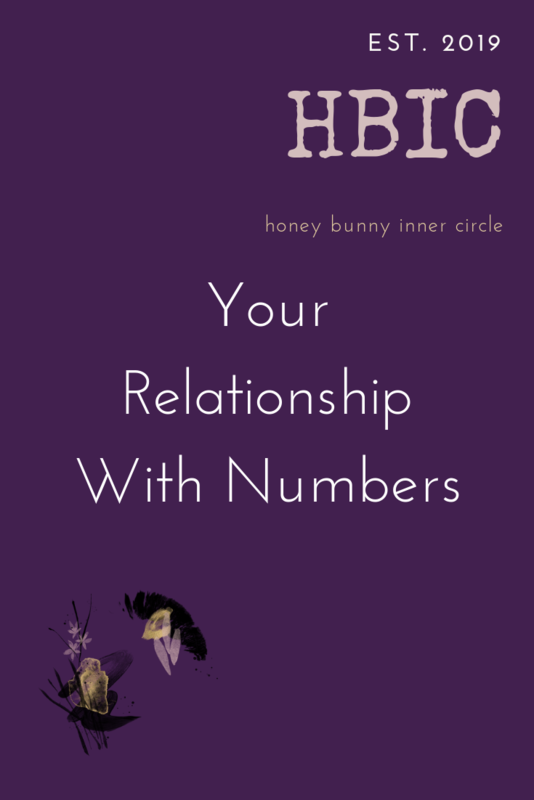 I share this with you because perhaps it’s time to reframe your relationship with numbers. If you are struggling with the number on the scale, consider that you’re being given an opportunity to love your body just as it is AND to see just how strong your body really is. If it’s your GPA, perhaps it’s time to consider that your intelligence could never really be measured by conventional standards. Or if it’s the amount of followers you have, perhaps you remember that Jesus had 12 followers as opposed to 12 million. There’s a new blog post up today called, “Self-Love Truthbomb: You Are More Than Your Numbers,” and I encourage you to read it every time you find yourself working yourself in a tizzy over your numbers. There is no number than could ever encapsulate your worth. I hope you will always remember that. Now it’s your turn. Hit reply and let me know more about your relationship with your numbers. How can you reframe it today?